The game begins with a jump ball. 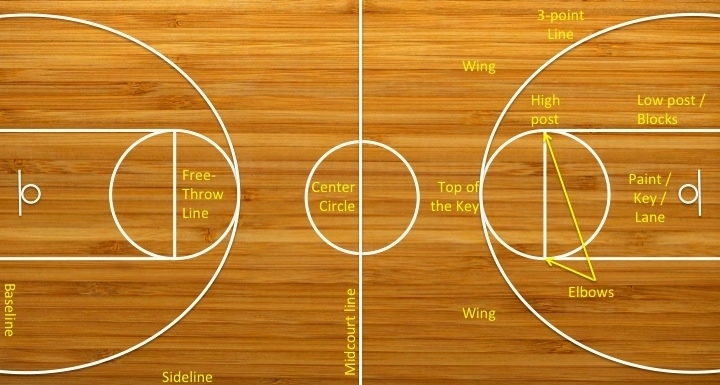 For a jump ball, the two opposing teams will line up on either side of the middle of the basketball court, with one representative from each team at the center of the court in the center circle. A referee will toss the ball up into the air between the two players, and each will jump to try and tip the ball to one of their teammates to gain possession of the ball. The team that gets possession of the ball begins on offense and will advance down the court toward's their opponent's basketball hoop. In order to advance the ball, the player in possession of the ball must dribble it (bounce it), or pass it to a teammate. The offensive players will then try to score points through field goals, i.e. getting the basketball through their opponent's basketball hoop during regular play of the game. There are two types of field goals: 3-pointers, when the basketball is shot from behind the 3-point line or 2-pointers from any distance inside the 3-point line. The team on defense is working hard to steal possession of the ball for themselves, block offensive player attempts to get baskets, and rebound the ball if it does not go into the hoop after a shot attempt. If a basket is scored, possession of the ball will switch to the team that was on defense.